Or maybe he was just a perv! A Cunning Trap, I'm afraid!! Many airships are, when loaded, heavier than air and rely on thrust/ aerodynamics to get and stay airborne. Wikipedia tells me that when the aerodynamics support more than 40% of the load, we move into a new category of hybrid craft. Between 0% and 40% we have heavier than air airships. A chum of mine was a pilot with Airship Industries in the early 80s and told me that to pick up speed, you went into a power dive. Something he had not anticipated. Trapped in your own trap. As an "airship" is technically defined as a steerable self-propelled aerial vessel that cannot leave the atmosphere, we could include aeroplanes and helicopters. The popular definition, however, is a powered lighter-than-air vessel such as a blimp or "Zeppelin". Oh dear - a talking website. You need to learn to think for yourself, TBK. Counter-KLAXON! 3 points, well done. I save this factoid for a quarter of a century and then blow it with one loosely phrased sentence. Ho hum. Quite right, Mike: I certainly cannot claim that all dirigibles and blimps are always flown heavier than air. Only that some are sometimes.
? Perhaps "get...airborne" was wrong as well. Is there no end...?. A million points to me. Anyway, thanks for the rather beautiful picture. And I persist in finding it interesting that the aircraft we all know to be lighter than air, often isn't. You weren't exactly wrong ("airship" can mean an aeroplane), but around here you need about half a page of disclaimers to make any sort of statement. I was also right about at "lighter than air" aircraft, (except when they're parked), at least some of the time. You weren't exactly wrong* ("airship" can mean an aeroplane**), but around here*** you**** need about half a page***** of disclaimers****** to make any sort of statement*******. bob - the perfect QI post. An airship can *fly* wilst heavier than air, but it cannot take-off or land in such a condition, with the possible exception of airships with vectorable thrust like the Airship 600 series (I say "possible" exception because whilst it can physically do it the regulations prohibit flying in such a configuration for safety reasons). 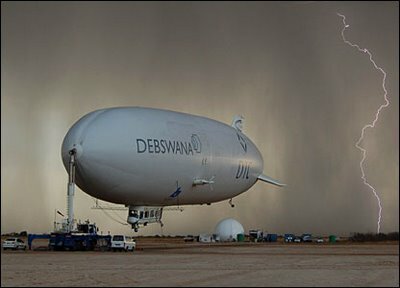 It is possible for an airship to fly whilst heavier than air because its hull develops aerodynamic lift when moving. It can get into this condition as a result of a gas leak, an extreme change in ambient humidity, airframe icing and one or two other more obscure conditions. But as the "wing" planform of an airship has an extremely low aspect ratio it has a very flat lift slope (dCl/d(alpha) can be down below unity ra5ther than the 4-6 region for most aeroplanes and 2Pi for an infinte aspect ratio) which means that it cannot generate useful boosts of lift coefficient by hauling the nose up. The means that an attempt to land whilst heavier than air would require a very long, fast and flat approach and a very long runway. Even using the vectored-thrust systems of the Airship 600 it is not practicable to attempt to take off and land whilst heavier than air simply because once stationary the vehicles would fall over; they have no undercarriage or struts to support themselves.